Inspection certificate — a static and cyclic hydrostatic pressurization of the piping — CEPS a.s. Inspection body TÜV NORD confirms that CEPS fulfils the conditions for a static and cyclic hydrostatic pressurization of the piping and its parts. 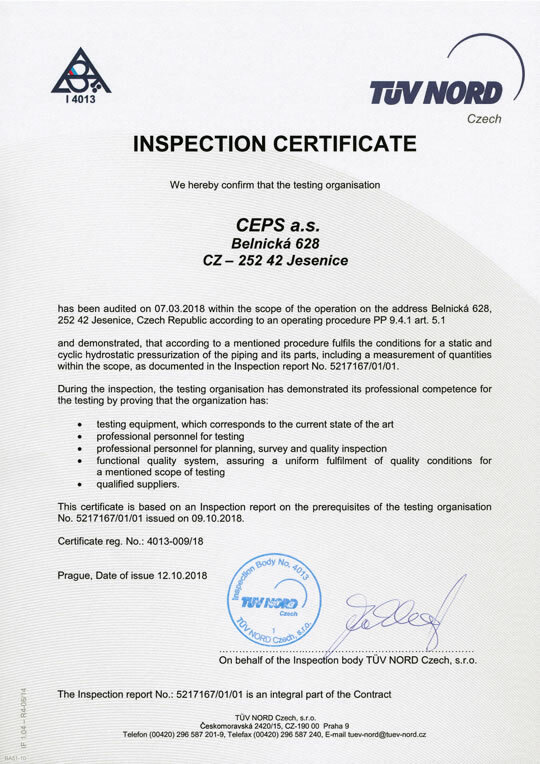 has been audited on 07.03.2018 within the scope of the operation on the address Belnická 628, 252 42 Jesenice, Czech Republic according to an operating procedure PP 9.4.1 art. 5.1and demonstrated, that according to a mentioned procedure fulfils the conditions for a static and cyclic hydrostatic pressurization of the piping and its parts, including a measurement of quantities within the scope, as documented in the Inspection report No. 5217167/01/01. This certificate is based on an Inspection report on the prerequisites of the testing organisation No. 5217167/01/01 issued on 09.10.2018. The Inspection body TÜV NORD Czech, s.r.o.